Donald Trump is a compulsive insulter. When faced with any criticism or opposition, he resorts instinctively to taunts and put-downs. His smears and invective are so unremitting that they no longer shock. It’s simply a given: If you spar with Trump, you’ll be slandered by Trump. For all that, the president’s jeers still sometimes manage to set a new low for indecency. Last Thursday, taking questions from reporters on the White House lawn, Trump was touting his administration’s economic record. Then he abruptly pivoted to his budget dispute with Democratic leaders Nancy Pelosi and Chuck Schumer. Trump’s disparaging comment didn’t draw much attention — not as much as if he had unfavorably compared the speaker of the House and the Senate Democratic leader to, say, ISIS or the Mafia or Bashar al-Assad. Yet China’s communist rulers are worse than all of them put together. Whatever else might be said about Pelosi and Schumer, they are elected public officials who took an oath of loyalty to the Constitution. They are no paragons of virtue and nobility, but when it comes to honor they are probably no better or worse than most politicians who spend decades in Washington. The dictators who rule China, on the other hand, are among the cruelest, bloodiest monsters on earth. The regime that Trump describes as “far more honorable” than Pelosi and Schumer has murdered, since seizing power in 1949, up to 80 million people. It maintains its grip on power with unrelenting brutality. From its occupation of Tibet to its murderous repression in Xinjiang, from its slaughter in Tiananmen Square a generation ago to its persecution of Christians today, China’s government routinely violates every norm of morality and human rights. It engages in torture. It imprisons a million religious minorities in forced-labor camps. It systematically harvests vital organs from prisoners of conscience. “China has many laws but no rule of law,” declared Charter 08, a human-rights manifesto signed by more than 300 brave Chinese dissidents in 2008. Under the country’s communist rulers — the ones Trump finds “easier to work with” than Capitol Hill’s top Democrats — “tens of millions [of Chinese citizens] have lost their lives, and several generations have seen their freedom, their happiness, and their human dignity cruelly trampled,” the dissidents wrote. But China’s malignance isn’t confined within its borders. When Trump extols the honor of China’s dictators, he is commending rulers who are implacably committed to thwarting the United States and undercutting US interests. This isn’t a view promoted by White House critics. It’s the view endorsed in the Pentagon’s most recent National Defense Strategy, which warned that China and Russia “want to shape a world consistent with their authoritarian model — gaining veto authority over other nations’ economic, diplomatic, and security decisions.” China in particular has taken actions “that are out of step with international norms, diminish countries’ sovereignty, or undermine the security of the United States, our allies, or our partners,” the administration bluntly stressed. Beijing makes no secret of its determination to eliminate American military influence in the Western Pacific, and engages in constant cyberwar against US forces — stealing data from Navy and Air Force contractors, for example, and hacking into Pentagon personnel records. Toward Taiwan, its independent, democratic, and pro-American island neighbor, China has been especially menacing. It has stockpiled thousands of ballistic missiles, and regularly threatens to go to war to bring Taiwan under Chinese rule. This is the regime that Trump deems “far more honorable” than Democratic leaders. Even for a president obsessively given to insulting his critics, that is a shamefully low blow. 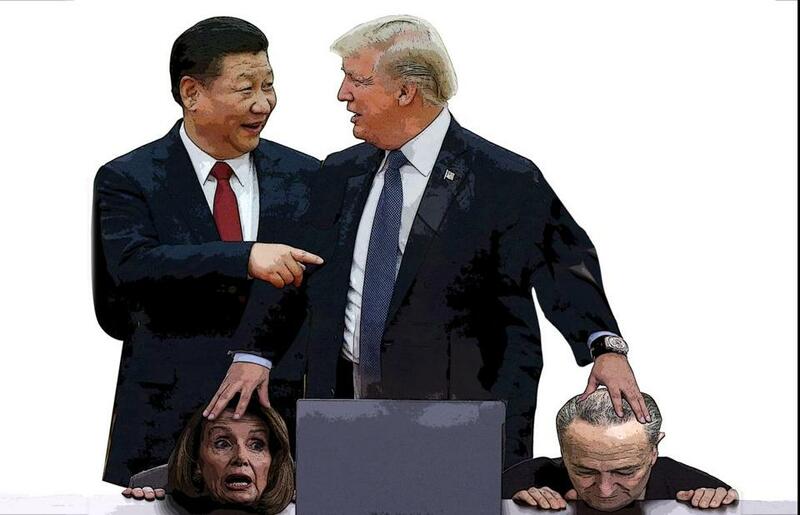 Pelosi and Schumer are not mass murderers or pitiless enemies of the United States. China’s rulers are. It is a stain on America’s reputation that it elected a president who professes to see more honor in our enemies than in the leaders of the US Congress.